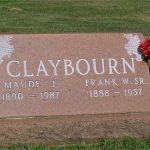 Frank Williams Claybourn was born on 3 July 1888 in Texico, Illinois, to Charles and Lavada Claybourn. He worked for the Mt. Vernon Car Manufacturing Co. for forty-nine years along with other relatives and Claybourn men. [Frank W. Claybourn also listed “farm hand” as an occupation on his World War I draft registration card.] On 20 October 1908 he married Maude Jane Beal. [Maud Beal was born on 8 March 1890 in Mt. Vernon, Illinois, to Enoch Moore Beal (1852-1936) and Mary Isabelle Smith (1888-1957).] They lived in Texico and Mt. Vernon, Illinois, and had eight children together. Frank died on 30 September 1957 and is buried at Pleasant Hill (south of Dix) in Illinois. Following Frank’s death, Maude made her home at Kell, Illinois. She died on 1 July 1987 in Santa Barbara, California. Clinton Moore Claybourn was born 18 May 1910 in Texico, Illinois. He lived at LaGrange, Illinois, and shipped the starting gates for horse racing to race tracks all over the world. In 1934 he married Elmo Louise Klarr of Lincoln, Illinois (born 27 September 1912). They had no children. Clinton died on 8 March 1965 in Cook County, Illinois. 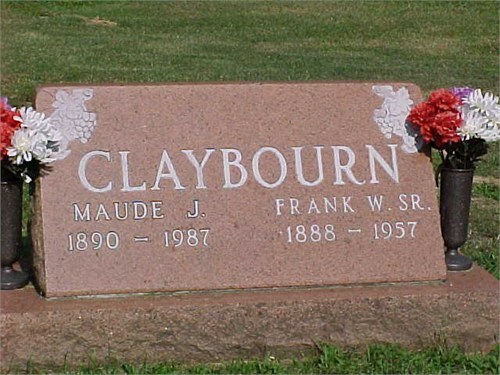 His wife called herself Louise E. Claybourn and died on 7 September 1998. They are both buried in Bronswood Cemetery in DuPage County, Illinois. Charles Divine Claybourn was born on 26 September 1912 in Mt. Vernon, Illinois. On 10 June 1939 he married Dorothy A. March (“Dot”). [Dorothy was born on 30 June 1917 in Arkansas to James March and Gertrude Pearl Morton.] Charles and Dorothy lived at Dix, Illinois, but Charles worked as an electric welder in the C.B.&Q. Railroad shops at Centralia, Illinois. They had eight children, listed below. [Salem Lions Club, History and Families: Marion County, Illinois (Salem Lions Club, 1995), 152.] Charles died on 25 February 1986 and Dorothy died on 19 April 1999. They are buried together in Romine Prairie Cemetery in Marion County, Illinois. Charles Franklin Claybourn was born on 11 March 1941 in Mt. Vernon, Illinois. He served in the Marine Corps and on 6 August 1959 he married Jerry Ann Blakley. [Jerry Blakley, a female, was born on 8 December 1942. The family changed their name in her generation from Blakely to Blakley, so either of those spellings would be accurate.] They had two children together. Charles worked as a Marion County deputy. He died on 8 November 2004 and his wife Jerry Ann followed on 15 January 2008. They are buried in Romine Prairie Cemetery in Marion County, Illinois. Mark Allen Claybourn was born 22 July 1961 in Salem, Illinois. He married Joy M. Osborne on 17 December 1981 and the two lived in Salem, Illinois, but they eventually divorced. Michael Dean Claybourn was born on 22 April 1965 in McKenzie, Tennessee. On 27 November 1989 he married Beth Ann Roper and they had one child, Mary Elizabeth Claybourn, born on 24 September 1990. James Robert Claybourn was born on 10 November 1942 in Jefferson County, Illinois, and attended high school in Centralia, Illinois. He married on 26 December 1963 to Donna Nugent (born on 12 March 1944 in Gaines County, Texas) and they lived in Texas. Together they had three children. James died on 30 September 1996 in Aransas County, Texas. He is buried in Prairie View Cemetery in San Patricio County, Texas. Jody Robert Claybourn was born on 19 August 1969. He married on 8 August 1992 in San Patricio County, Texas, to Shaun Denise Patricia (born in 1970 in Bexar County, Texas). They had at least one child, then divorced there on 13 December 2004. Darian Kate Claybourn was born in 1996 in Harris County, Texas. Cason Don Claybourn was born on 18 August 1972 in Terry County, Texas. He married (1st) on 28 November 1992 in Arkansas County, Texas, to Angela Denise Fiebig (born in 1973 in Cameron County, Texas). They had two children, then divorced there on 14 November 2000. He married (2nd) on 23 October 2004 in Nueces County, Texas, to Tammy Quesnel (born in about 1972). Ryan Kaleb Claybourn was born in 1993 in Nueces County, Texas, He graduated from Flour Bluff High School in 2011. Gillian Renee Claybourn was born in 1997 in Nueces County, Texas. Jamie Christa Claybourn was born on 24 July 1978 in San Patricio County, Texas. She married (1st) on 7 March 1997 in San Patricio County, Texas, to Antonio A. Davila (born in about 1971) and they divorced on 19 October 2004 in Aransas County, Texas. She married (2nd) on 16 May 2005 in Aransas County, Texas, to Chad A. Adams (born in about 1977). She married (3rd) on 9 August 2010 in Nueces County, Texas, to Robert W. Peterson (born in about 1973). Anna Darlene Claybourn was born on 10 September 1944. She attended Southern Illinois University in Carbondale, Illinois, in the mid-1960s and married fellow student Brian Edward Bremer of Metropolis, Illinois, on 10 June 1967. He majored in agriculture and raised beef cattle. Anna worked as a teacher in Illinois. They had two children. Daniel Edward Bremer was born on 11 April 1972 in Chillicothe, Livingston County, Missouri. Rebecca Dawn Bremer was born on 24 July 1973 in Chillicothe, Livingston County, Missouri. Jackie Dean Claybourn was born on 21 December 1946 in Mt Vernon, Jefferson County, Illinois. He married (1st) in October 1976 to Ruth Ellen Lee (born on 26 December 1935 in St. Francois County, Missouri). She was previously married to Edward Charles Gilbert (1933-2006) and they had four children: Jerry, Russell, Kathy, and Brian, who Jackie embraced as his too. Ruth died on 23 April 2009 in Kankakee County, Illinois, and is buried there in Elmwood Cemetery as Ruth Claybourn. He married (2nd) on 11 April 2012 to Debbie A. Leisure (born in 1956 in Marin County, California). She was previously married to Mr. Hanshew and they had two sons, Michale P. and Brandon L., who Jackie embraced as his too. Jackie died on 12 August 2012 in Corpus Christi, Nueces County, Texas. He is buried in Romine Prairie Cemetery in Marion County, Illinois. Edcur Claybourn (“Eddie”) was born on 27 April 1949 in Mt. Vernon, Illinois. On 1 December 1972 he married Martha Thompson (born 27 July 1946). They had one child, Ragan Lynn Claybourn, born on 24 May 1978, and four step-children: Gene, Chris, Brian and Kurt. Eddie, his wife, and daughter lived in the State of Washington. Helen Louise Claybourn was born on 2 June 1950 in Marion County, Illinois, and died the next day. She is buried in Romine Prairie Cemetery. Aletha Jane Claybourn was born on 24 September 1953 in Centralia, Illinois. She had one son, Shawn David Claybourn, and later married Mr. Young and lived in Irvington, Illinois, and St. Louis, Missouri. Shawn David Claybourn was born on 11 March 1972 and married Maria Dometella Elmendorf. Together they had one child, Jennifer Ranae Claybourn, born in July 1991. They lived in Illinois. Shawn considered himself a “jack of all trades” in Centralia and also worked as a medic. Billie John Claybourn was born on 26 June 1958 in Centralia, Illinois. On 6 October 1979 he married Peggy Ann Qualls (born 12 Oct. 1950) and had two sons together. Billie died on 21 December 2002. Justin Eric Claybourn was born on 19 October 1980. Brandon James Claybourn was born on 24 November 1982. Lavada Belle Claybourn was born on 15 November 1914 in Texico, Illinois. She married on 5 October 1931 to Henry Eckhardt (born in Rochelle, Illinois). They lived on Route 2 in Amboy, Illinois, and had three children, listed below. Henry died on 6 January 1990. Lavada died on 7 September 2012 in Lee Center, Lee County, Illinois. They are buried there together in Woodside Cemetery. Reginald Lee Eckhardt Sr. was born on 20 July 1933 in Lee Center, Illinois. He was in the service for four years and served in the Korean War. He married Patricia Webb and the couple had three children. The family lived in Colorado in the area north of Denver. Reginald Lee Eckhardt Jr. was born on 26 July 1957. He married Joan Reighard on 1 September 1978. Together they had three children, listed below. Rebekah Lynn Eckhardt was born on 11 July 1979. She married Travis Kent on 5 August 2000. They had three children: (i) Alexander Scott Kent was born on 30 November 2002, (ii) Logan Donnelly Kent was born on 10 November 2006, and (iii) Ethan Allen Kent was born on 2 May 2008. Reginald Lee Eckhardt III was born on 14 January 1981. He married Katrina Merideth on 15 September 2006. They had four children: (i) Kaitlyn Elizabeth Eckhardt was born on 4 October 2002 from Katrina’s first marriage, (ii) Annabelle Ivy Eckhardt was born on 30 August 2004 from Reginald’s first marriage, (iii) Madyson Marie Eckhardt was born on 9 October 2007, and (iv) Emilee Rose Eckhardt was born on 14 August 2010. Jared Marc Eckhardt was born on 13 October 1985. He married Andrea Tuck on 11 June 2011. They had three children: (i) Brody Ronald Eckhardt was born on 12 September 2010, (ii) Kyler Marc Eckhardt was born on 7 August 2012, and (iii) Bowen Darrell Eckhardt was born on 10 November 2016. Michael Eckhardt was born on 14 August 1958. James Eckhardt and was born on 11 June 1960. Patricia Ann Eckhardt was born on 11 December 1938 in Lee County, Illinois. She married (1st) to Ronnie Schafer. She married (2nd) on 22 December 1969 in Pasquotank County, North Carolina, to James “Allen” Orndorff (born in 1925 in Frederick County, Virginia) and they divorced on 29 January 1974 in York County, Virginia. She married (3rd) on 25 June 1975 in Newport News City, Virginia, to David Arnold Carpenter (born in 1932 in Elizabeth City, Virginia). Patricia died on 27 August 1995 in Poquoson City, Virginia. Frank Eckhardt was born in 1943. He worked as a heavy equipment operator and mechanic for the International Union of Operating Engineers Local 150. He lived virtually his entire life since the age of three at the same home, and was born just a fourth of a mile from there. Frank passed away on 26 June 2016. 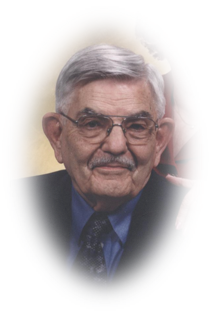 Harley Joe Claybourn (“Joe”) was born on 26 March 1918 in Texico, Illinois. He served four years in the U.S. Navy and 3.5 years of it overseas. He attained the rank of Seaman First Class. After the war he worked as a machinist and lived on Route 3 in Amboy, Illinois. He married (1st) on 1 May 1937 to Mildred Amelia Meadows. [Mildred was born on 23 September 1918 in Shiloh Twp., Jefferson County, Illinois, as the daughter of George W. and Dora (Neabuhr) Meadows.] They had two children before Harley’s military service. Mildred was granted a divorce from Joe on 10 September 1948 in Jefferson County, Illinois. Joe narrowly escaped death on his way home to rural Dix from a night-shift job in Centralia on 13 December 1950. Mildred reunited with Harley, with or without marriage, as they had three more children afterward while living in Amboy, Lee County, Illinois. Mildred lived and worked in Amboy most of her life. She was a nurse’s aid at the Amboy Rehab Center until her retirement. She was a member of Assembly of God Church in Dixon and enjoyed to read her Bible, crocheting, and crossword puzzles. Mildred died at age nintety-three on 12 December 2011 at the Ogle County Hospice Serenity Home in Oregon, Illinois, and is buried in Oakwood cemetery in Lee County, Illinois. Eleven months prior to the birth of his last child with Mildred, Joe had a daughter in Amboy with a woman named Dorothy to whom he was not married. Joe married (2nd) to Evelyn Mae Cooper on 1 July 1961 in DeKalb County, Illinois. She was born on 6 December 1919 in DeKalb County, Illinois, and was previously married to Charles Fayette Thompson (~1913-1958) with whom she had five children. Joe and “Ev” moved to the State of Washington. He died in Cle Elum, Kittitas County, Washington, of cancer on 14 July 1985 with his wife and best friend at his bedside. His ashes were scattered over his favorite fishing spot. Evelyn eventually moved to Maple Valley, King County, Washington, where she died on 25 March 2014. Jo Ann Claybourn was born 20 October 1938 in Ashley, Illinois, to Joe and Mildred Claybourn. She never married and worked as a nurse’s aid in a Franklin Grove nursing home. 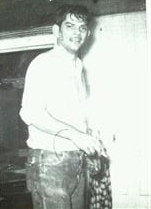 Delbert Wayne Claybourn was born on 11 June 1940, in Mt. Vernon, Illinois, to Joe and Mildred Claybourn. He was in the U.S. Navy and the Merchant Marines, achieving the rank of seaman first class. Delbert probably had a first marriage in about 1961 while he was in military service that produced two daughters in the Boston area. He worked as a truck driver for most of his life. In about 1971 Delbert married Judy A. Meacham (born in 1948 in King County, Washington) and they had three children in the Seattle area. Their marriage ended and she married again in 1989. Delbert died on 28 December 2008 in Sterling, Whiteside County, Illinois, and is buried in Oakwood Cemetery in Lee County, Illinois. Deborah A. Claybourn was born in 1962 in the Boston area. Theresa Ann Claybourn was born on 24 December 1964 in Boston, Suffolk County, Massachusetts. She married Leo Fazio Jr. on 27 April 1988 in Clark County, Nevada. Theresa died on 21 May 2003 in Boston. Douglas Wayne Claybourn was born in 1971 to Delbert and Judy. He married Barbara Jean Otto on 21 August 2002 in Clark County, Nevada. Leanne Lynn Claybourn was born in 1973 in King County, Washington, to Delbert and Judy. She married on 14 September 1993 in Cowlitz County, Washington, to David Thomas Gilchrist (born in 1968 in Orange County, California). Steven Claybourn was born in 1974 to Delbert and Judy. Judy Lynn Claybourn was born in 1952 in Amboy, Illinois. She married (1st) in August 1972 to Gerald Full (born in 1951). They had a son named Lucas. She married (2nd) to John “Jack” King and lived in Amboy. Janet L. Claybourn was born in 1954 in Amboy, Illinois, to Joe and Mildred Claybourn. She married in January 1972 to James W. “Jim” Reinhold (born in 1951 in Lee County, Illinois), who played on the Amboy High School football team. They had two daughters. Before 2010, Janet and Jim moved to South Carolina. Renee C. Reinhold was born in 1972 in Lee County, Illinois. She was her grandmother’s special caregiver in her last years. Amy Beth Reinhold was born in 1974 in Lee County, Illinois. She married on 24 March 2003 in Clark County, Nevada, David Robert Reiss (born in 1964). Tina Louise Clayborne was born in on 12 December 1957 to Joe Claybourn and a woman named Dorothy (they were not married). Tina married a Mr. Durant. She later married Bradley Jay DeVoll (born in 1960) and they were living in Estherville, Iowa, in 1995. They had two daughters, Sabrina and Nikita, then divorced on 2 August 1999 in Emmet County, Iowa. She then married Edward D. Bolen (born in 1954). They divorced on 31 October 2005 in Humboldt County, Iowa. Craig Claybourn was born on 13 November 1958 in Amboy, Illinois, to Joe and Mildred Claybourn. He married a woman named Terri and lived in Yuma, Arizona. Frank Williams Claybourne was born on 28 April 1921 in Texico, Illinois. According to his brother Bobby, Frank spelled his last name with an “e”. Frank married on 12 December 1942 to Ruth Kell (born 5 April 1925 in Kell, Illinois) in Clayton, Missouri. They were married five days when Frank went into the Marine Corps during World War II where he served with the Third Division in the Pacific Theatre, Iwo Jima, Guam and Guadalcanal. He met his brother Bob on Iwo Jima in 1944. He also served in the Army National Guard from 1945 to 1952. Frank eventually became a pastor with his first congregation at Sandoval Baptist Church in Sandoval, Illinois. Thereafter he served at First Baptist Church in St. Elmo, Illinois (1958-1964) and Allen Park Baptist Church in Galesburg, Illinois (1964-1966). His last service was with Calvary Baptist Church in Pittsfield, Illinois from 1966 until his retirement in 1981. After his retirement, Rev. Claybourne served as pastor for the Independence Christian Church for eleven years. He served on the Board of Directors for the Illinois Baptist State Association and was the president of local ministerial associations in St. Elmo and Pittsfield. In addition to his pastoral duties he was a bus driver for the Pikeland Community School District for thirty-four years. He also served on the Illini Hospital Board of Directors, served as a hospice minister, led Bible studies at local nursing homes, and delivered Meals on Wheels. Rev. Claybourne was devoted to his church and family. His brother Bobby recounted that Frank was respected by all, noting, “Mom didn’t think he could do anything wrong.” Ruth died on 26 March 2012 and Frank died on 8 August 2014. They are buried together in Pittsfield West Cemetery. Ann Claybourne was born on 7 February 1946 in Mt. Vernon, Illinois. She attended Illinois State University in Normal, Illinois. She married William “Bill” Spitler, who was born in 1945, and together they had two children, listed below. William H. Spitler was born in 1974. He was raised in north central Illinois and graduated from Eastern Illinois University in 1997 with a degree in history. He graduated with honors from the University of Arkansas School of Law in 2000 and later practiced law in Tulsa, Oklahoma. He married Cindy and they had three sons: Hayden, Teddy, and Ryan. Amy A. Spitler was born in 1977. She is a licensed clinical social worker in Chapel Hill, North Carolina. She married Daniel Andrew Levine, born in 1977, and they had two daughters, Ellie and Alice. Lynn Claybourne was born in about 1960. She married Ken Gilmore and they lived in Springfield, Illinois. They had two daughters, Catherine and Elizabeth Gilmore, and a son who died young, Daniel Gilmore. William Burrell Claybourne (called “Billy”) was born as a twin on 4 June 1924 in Centralia, Illinois. According to his twin brother Bobby, Billy spelled his last name with an “e”. Billy served in the U.S. Navy from June of 1942 until the end of World War II. He was a ship’s cook, Third Class. After the war he spent two more years in the Navy and then proceeded to make the Army a career. Eventually he attained the rank of sergeant first class, stationed at Seattle, Washington, and married Hazel May McKowan. [Hazel McKowan was born on 21 October 1922 in Vancouver, Clark County, Washington.] Hazel had a child, called “Bunny,” born in New Jersey. Hazel died on 26 September 2001 in Wilcox, Cochise County, Arizona, and Billy died there less than two months later on 19 November 2001. Robert Earl Claybourn (called “Bobby”) was born a twin to Billy on 4 June 1924 in Centralia, Illinois. He married on 23 September 1942 to Mary Louise Perry of Salem, Illinois, in Charleston, Missouri. [Mary Louise Perry was born on 20 September 1925 in Salem, Marion County, Illinois.] During World War II he served in the 4th Marine Division of the U.S. Marine Corps in the Pacific Theatre for two years. Bobby and Mary had three children, listed below. After the war Bobby graduated from the Barber Institute in Decatur, Illinois, and came to Mt. Vernon, Illinois, in 1947, first working on Broadway Street. In 1955 he became a co-owner of a barber shop with Edwin Karcher and lived at 2208 Cherry Street in Mt. Vernon. Bobby and Mary were Baptists. Mary passed away on 25 January 2003 in Mt. Vernon, Jefferson County, Illinois, and is buried there at Pleasant Hill Cemetery. Bobby Earl Claybourn Jr. was born on 2 May 1944 in Salem, Illinois. He attended Mt. Vernon High School and married (1st) to Sandra Wells on 3 July 1965 in Jefferson County, Illinois. Bobby received a bachelor of arts degree in chemistry from Southern Illinois University. Later he served as a captain in the Strategic Air Command, was chief evaluator pilot in the B52G Bomber, and later maintenance supervisor in the Field Maintenance Squadron at the Mather Air Force Base in California. Bobby married (2nd) to Mary Katherine and they lived in Cochran, Georgia. Debra Kay Claybourn was born on 6 September 1956 in Mt. Vernon, Illinois. She was a charter member of the Modern Music Masters at Mt. Vernon High School and was one of sixteen students chosen to represent the United States at the Expo ’74 World’s Fair in Spokane, Washington. She earned her bachelor of music education degree at Illinois Wesleyan University. Debra married Jeffrey VanScoyk and resided in Aurora, Colorado. They had two children. Kristin Page Van Scoyk graduated from Arvada West High School in 1997. Ryan Carter Van Scoyk was an accomplished saxophone performer in jazz, popular, and sacred music. Ryan’s chamber ensembles have received numerous honors, including selection as one of the top four wind ensembles in the finals of the Alice Coleman International Chamber Music Competition (Promethean Quartet, 2013), honorable mention in the Ohio Music Teachers’ National Association Competition (Promethean Quartet, 2013), and alternate in the Southern California International Competition (Ubuntu Duo, 2014). The Promethean Quartet completed a five-state tour in 2013, including several performances and masterclasses at public schools and universities. Donna Marie Claybourn was born on 11 February 1958 and died two days later on 13 February 1958. She is buried in Pleasant Hill Cemetery in Jefferson County, Illinois. Lorena Jane Claybourn was born 21 February 1927 and graduated from Mt. Vernon High School in 1945. She married (1st) on 5 January 1946 to Laddie Cerny (1922-2001) of Chicago, Illinois. He was a private first class in the Air Force and graduated from the Chicago Conservatory of Music. They divorced and Lorena married (2nd) on 12 September 1958 in Cook County, Illinois, to Dr. Arthur Richard Lane (born on 22 March 1920 in Illinois) and the two lived in Chicago, Illinois. Dr. Lane died on 16 October 1971 in Santa Barbara County, California, and is buried in Santa Barbara Cemetery. Lorena married (3rd) on 26 March 1973 in Santa Barbara County, California, to James P. Cordero (born about 1933) and then divorced there in October 1977. Lorena died on 11 June 1992 in Carpinteria, Santa Barbara County, California, and is buried with her second husband in Santa Barbara Cemetery.